New to Sunday Lately? It works like this: every week there are prompts from the Blogger Tribe (led by Katy, Angelica, Meaghan, and Nicole) to describe what is happening in your life. Then you join the linkup and we e-hang out every Sunday, sharing that small glimpse into everyone else’s corner of the world. Trust me, it’s really fun. This week’s prompts are: Doing, Appreciating, Designing, Humming, Expecting. It’s been a busy week, but yesterday was especially packed – in the morning I went to volunteer at our city’s Ride for Refuge. If you haven’t heard of it, it’s a cool idea and supports multiple charities in Canada and the US who raise money for displaced, vulnerable, and exploited people. I was brought in by friends who volunteer with Matthew House Ottawa, and helped to serve with the food team. It was great fun, and so far they’ve raised almost $80,000!!! Donations are still being accepted, and though I haven’t registered to be pledged donations, some of my friends have – if you’re interested in donating to this great cause, you can sponsor the Crazy Camels – every little bit counts! Relaxing Sundays. I’ve said this before & I’ll likely say it again – Sundays are the best day of the week. Today has been full of toddler snot & now a sick husband as well, but I’m just so grateful that we have the day to rest & recover before work starts tomorrow. More things than my husband wants to hear about – he’s often on my case about finishing projects that I’ve started before moving on to something else. I see his point of view, but I also see that it’s nice to have more than one thing to work on, for when one project gets too boring or overwhelming (or I have to wait for fabric to arrive in the post or be pre-washed once it has arrived). This week that just passed I finished hanging some artwork around the house (a “project” that was supposed to be done a couple months after we moved in 2 years ago! ), and I finished re-doing a dresser that I started at the beginning of June. It’s nice to finally have that one out of the living room & into our bedroom where it belongs! newworldson – pretty much their entire discography! lol. My son LOVES their music, and so do I, so cranky teething baby + newworldson = happy smiles & living room dance parties = happy mom. It’s a pretty awesome equation. This week’s prompts are: Planning, Loving, Reading, Wishing, Feeling. The weather! I just had to say it, because I know some people say they love fall, but as soon as the weather turns cold they start to complain that A) it’s cold and B) how much they hate winter. Just to be clear, after my weeks of agonizing over the heat, I. AM. SOOOOOOOOOO. HAPPY!!! Seriously, our heat wave broke a couple days ago and we’ve been sitting around the 17-21 degree mark, and I’m in love. I’m in love with the season, and with the clothes that I finally get to wear again (and to dress Baby Rydz in!). 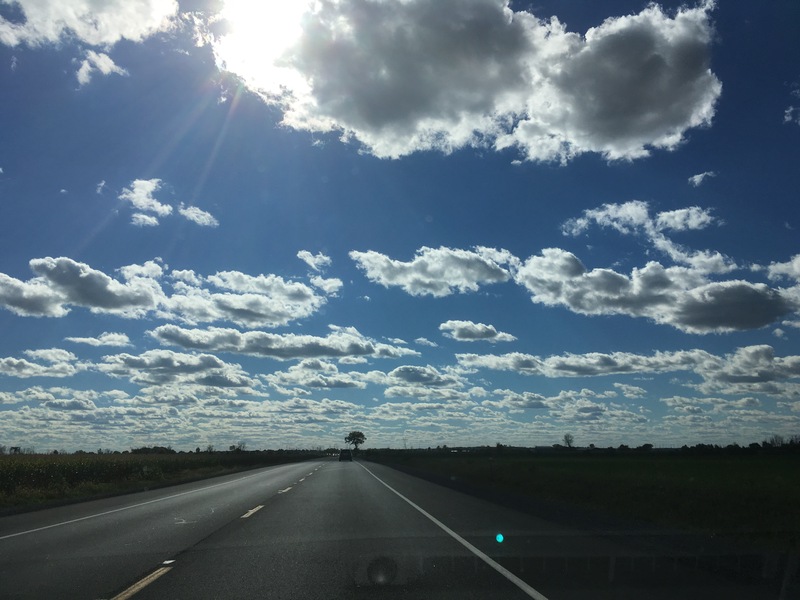 And have you ever noticed how gorgeous the sky is during the few short weeks of fall? I don’t just mean sunrise or sunset, but every time of day – something about the weather is just so spectacular, even before all of the leaves start to change. 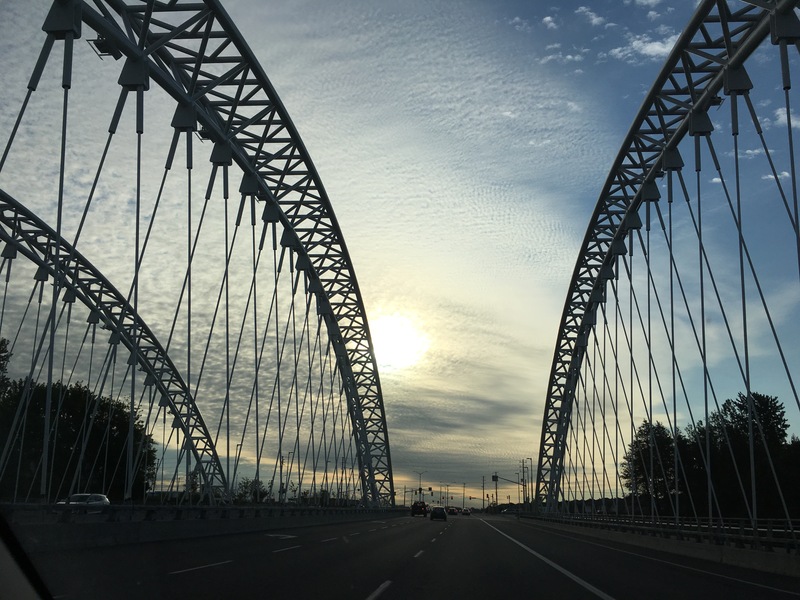 Driving into town has never been so beautiful. Little Women by Louisa May Alcott. Well, in theory that’s what I’m reading, and I was supposed to have it done by next Friday’s book club. But, next Friday’s book club has been cancelled & we’ll discuss 2 books next month…which is probably for the best, since I haven’t actually started it. 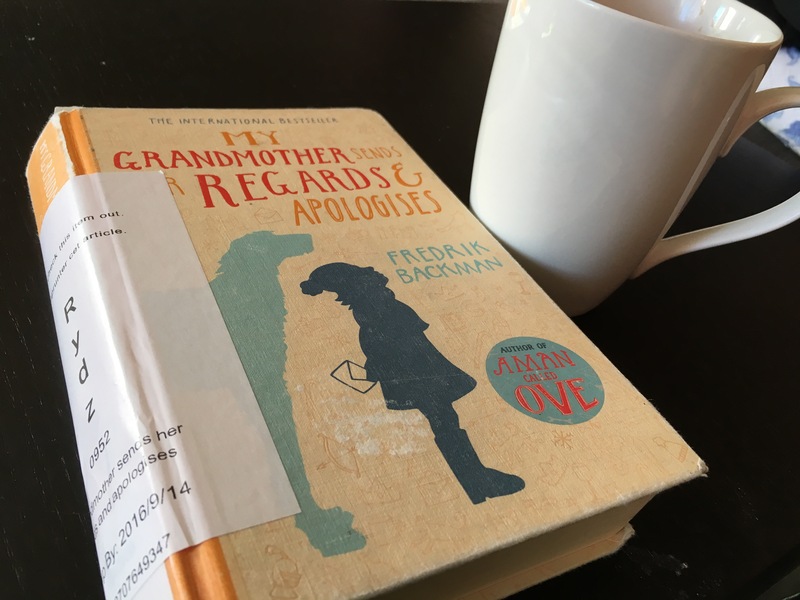 On the bright side, I’m already halfway through next month’s book – My Grandmother Sends Her Regards and Apologises by Fredrik Backman and I’m really enjoying it! I’ve also already finished November’s book – After You by Jojo Moyes – it’s another one that I’d recommend, but read the prequel first! Actually I can’t think of anything that I’m really wishing for – I have a lot to do, but for once I’m not finding myself wishing away the time or the responsibility. It’s odd, but refreshing to just be so content with life right now. Except maybe, if someone could do something about the obnoxious number of spiders that are trying to invade my house, that would be great. When I came home after dark last night, I counted 7 of them taking up residence around the front door. SEVEN! And those are just the ones that I could see in the dark. UGH. Sometimes country living does have it’s downsides. This week’s prompts are: Creating, Finding, Switching, Forgetting, and Craving. I’ve been on the hunt for a dolman shirt that won’t become too boxy when I use a thicker, more solid cotton/lycra to make it. Ages ago I bought some custom knit material that is gorgeous, with the dream of making it into a dolman, before I ever had the exact pattern in mind. Now it’s months later, and I have the actual material in hand…but no pattern! 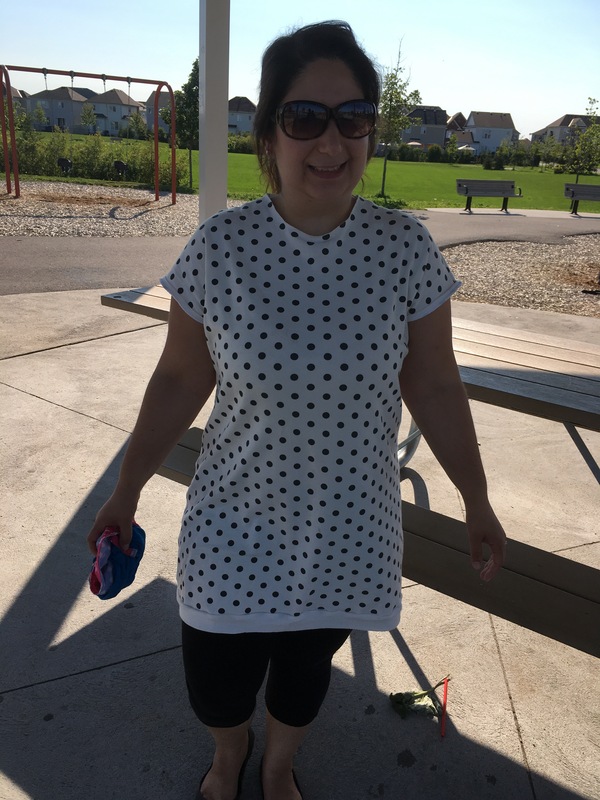 On Thursday I put out a call in one of my go-to Facebook groups for sewing, and the feedback I got was overwhelming – I had no idea so many women were so passionate about their dolman-style tops! In the end I chose the Weekender Tunic (aff) from 5 out of 4 Patterns, and I have to say that I am just pleased as punch! So pleased, in fact, that I made another one to wear to church today. It is everything that I wanted in a dolman pattern, and even though I know & love this company, I had completely overlooked it/would have missed it without someone’s suggestion (so thank-you, you know who you are!) Here’s my muslin (with & without the belt), what do you think? New shows on Netflix! Has anyone else watched When Calls The Heart?! It’s dorky, and I love every second of it. In 3 days, I’m already on episode 6. Watching while I’m pumping, taping & cutting patterns, & cutting fabric. I just keep finding reasons to watch, even if I don’t need one. Switching gears into fall mode: on Monday I had my first committee meeting for a fall/winter activity, which officially means that fall activities are nearing full swing! The nights are cold, the pumpkin spice syrup is flowing, and the slippers have come out – I am more than ready for the return to routine and the seasons that I love. Speaking of fall activities, I forgot to register my son for his swimming lessons. Yikes! When it comes to activity registration with the city, there’s usually drama of some sort, and parents wait online an hour or so before registration opens just to make sure that they get a “good” time slot. And registration opened on August 8th. Whoops! On the bright side, we like to sign up for the French lessons, and since we live on the mostly English end of town, there were still 8 spots available for our preferred time slot. Thank God we like to buck the trend on this one – consider him registered, and adorable Duck-level pictures will follow (or, should I say, <<les photos du niveau canard>>)! Have a blog? Don’t forget to share your Sunday Lately post in the linkup too! It has been a busy, weird, and wonderful last couple of months, but with Labour Day around the corner and school starting this Tuesday (or already started, depending on where you live) I’ve come to realise that summer really is coming to a close, and it’s time to jump back into a regular fall/winter routine. With that in mind, I’m really looking forward to making this series, Sunday Lately, a regular part of my blogging routine for the next few months. I’m sure there will be weeks off here or there, but I’ve enjoyed reading everyone else’s Sunday Lately posts the last few weeks and decided it’s time to jump in myself! It works like this: every week we’re given prompts, and we respond to them on our blogs, then join the linkup that you can find on any of the Blogger Tribe leaders’ blogs (Katy, Angelica, Meaghan, and Nicole). Then we all e-hang out every Sunday, sharing that small glimpse into the last week of life in our own worlds, and reading about everyone else’s. The last 2 months I haven’t blogged at all, and honestly every time I thought about how something would make a great post, and that I really should be posting more, I felt totally and completely liberated by the idea that this blog is personal rather than business, and I started it for fun. That means each and every time I found myself worrying that nothing had been published, I remembered that actually, I don’t have to publish anything – so I decided to relax and enjoy time with family and friends while the beautiful weather is still here. But of course I’m not the type to sit back and do nothing at all, that’s taking it just a lii-iittle too far for my taste. My compromise was to participate in the photo-a-day challenge hosted by Blogger Tribe on Instagram. If you haven’t been following along, check it out here – it’s been a fun month of photos, and again because it’s just for fun, I didn’t panic when I missed a day here or there. Hands-down my favourite part of summer/Marc going back to work after his paternity leave ended at the beginning of June has been weekends. We’ve relaxed, we’ve gone on adventures, visited with family, participated in local festivals, visited farmer’s markets, played at splash pads, and picnicked in parks. Sunday mornings, though, are the best of all – after busy Saturdays of housework and adventures, but before we head out to church, Sunday mornings are when we take it slow. Baby Rydz usually has us up by 6am, but there’s no rush to shower, dress, eat, and get out the door – it’s lazy times spent on the couch, enjoying a hot coffee together, watching our kidlet play and having the chance to just be our little family of 3. This is when I started reading so many of the Sunday Lately posts – relaxing blogging for a relaxing morning, it almost feels like going to the spa! Almost. Usually, this would be nothing, because designing is really not my thing. But conveniently enough, my sewing machine has been broken, and rather than replacing it & being indoors sewing all summer, I’ve just let it go/put off buying a new one. Probably also because it will be expensive. So instead, I’ve been ordering/hoarding fabric, and while waiting for it to arrive I’ve been sketching out all of the things I’m going to make. Just please remember to take the terms “designing” and “sketching” very liberally in my world, since most kindergardeners would be embarassed for my stick people. There’s no false humility here, trust me – I’m really good at a lot of things, but I totally missed the boat on the drawing gene! The Hairspray Soundtrack! In case you didn’t already know, I’m a huge fan of musicals. Like, HUGE. I’m that nerd who wept during “Defying Gravity” when I saw it on Broadway. It. Was. TRAGIC!!! Yep. Anyhow…I was also a big fan of Hairspray well before the movie existed, but I’m not going to lie – I really like the movie too! The top 3 that have been on repeat in my head (and my phone) are “Without Love,” “Run And Tell That,” and “(I Know) Where I’ve Been” – BLM of the 60s, anyone? Baby Rydz is loving Hairspray too, it’s become his bath time soundtrack. Some days he gets so into it that we both end up soaking wet! Cooler weather to move in soon. Last year we were hit with an indian summer and Baby Rydz was actually born in the middle of a crazy heat wave, but this year I’m really hoping for fall to arrive soon. Summer is (don’t hate me!) my least favourite season, and if I had to choose, I’d rather skip it completely. Yep, I know, I’m weird. But I’m also done with the heat & ready for comfy fall styles, pumpkin spice lattes, and the end of this brutal humidity. Fall is possibly the happiest time of year for me – while everyone else laments going back to school and the cooler weather, I thrive in this return to routine with my love of hoodies and skinny jeans. I have a few things to sew up first, but then I’ll definitely be ready to put this summer behind us! So what are you up to today? But what do you wear to a cookie exchange?